Citation: Yasin Ozdemir, Seda Kayahan, Ozlem Utku. Developing a system for walnut husking to reduce wastewater formation and its comparison with industrial husking system for environmental perspective. J Food Technol Pres 2018;2(2):22-27. Walnut husking, Hull, Husk, Waste water, Peeling, Juglon. The main byproduct of walnut processing is the green husk which is removed from walnut shells by use of husk machines with abrasive metal elements operating while the walnuts are shaken under the pressure of water jets [1,2]. This wastewater contains high concentrations of phenolic compounds, including chlorogenic acid, caffeic acid, ferulic acid, sinapic acid, gallic acid, ellagic acid, protocatechuic acid, syringic acid, vanillic acid, catechin, epicatechin, myricetin and juglone, with higher concentrations of juglone than the other phenols [3,4]. There is significant evidence that polyphenols are the major compounds responsible for walnut husk wastewater phytotoxicity and inhibiting the growth of soil and water microorganisms [5,6]. So that reuse of walnut husking wastewaters is not a common practice which is restricted by the potential negative impact of this wastewater on soil and crops . In terms of product quality, walnuts should be harvested on time, their green covers should be removed and walnuts should be dried . Green shell of walnuts (husk) is usually removed manually or some machines working with water (MW). MW works with water by grinding husk. In this husking process, high amount of green colored water emerges as waste which has rich in antioxidants (especially juglon) and can cause environmental pollution. In addition, the walnut which contacted with water in this process and took inside the water by through capillary channels of its shell. This creates quality losses and can lead to the development of toxin-producing molds. For this reason, it is necessary for husking to be carried out without using water with an environmentally and productfriendly approach. This study is aimed to developing a new system for walnut husking without using water and compare with industrial husking system. This study was consisted of some results of “Determination of quality characteristics of walnuts belonging to some cultivar and cultivar candidates and developing new methods for walnut production” supported by Turkey Agriculture and Forest Ministry. Modified vegetable peeling machine (Avamore) without water inlet (MWO) was used for husking. Small size (max. 60 kg walnut capacity) industrial MW (Hilal) was used to compare (Figure 1). MW was loaded 20 kg walnuts and worked at 10/15 minute for each sample . Yalova 3 and Chandler walnuts were selected as material and harvested at last season before cracking of husk. Walnuts was selected according to the fruit diameter in the range of 24-27 mm. 1/2/3 kg of walnut loaded each time and machine worked 1/2/3 minute for husking without water. Husking rate and ratio of damaged walnuts were calculated by counting of un-husked and damaged walnuts. 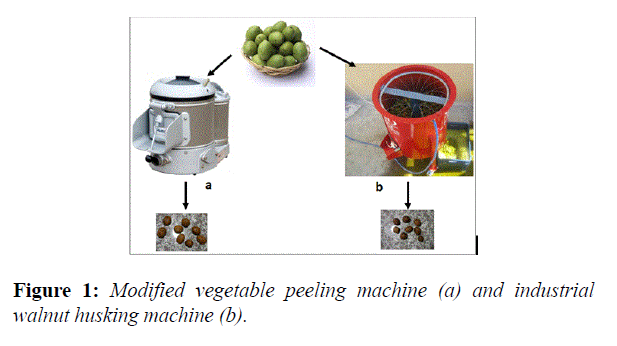 Figure 1: Modified vegetable peeling machine (a) and industrial walnut husking machine (b). Walnut husking success (%) of MWO and MW were given in Table 1. 100% removed husk from walnut was determined as successful husked. Husking success was important both for reduction of labor cost which was needed for removing of rested husk and increasing inner walnut and shell walnut product quality. Table 1: Walnut husking success (%) of mwo and mw. Husking rate was determined between 91-95% and 97-98% for MWO and MW. Highest husking rate achieved by 2 kg loading and 1 min working conditions for both cultivars. Damaged or walnuts less than 0.5% for both machines. Nearly all of these damages were determined on unhealthy walnuts such as hollow, shrunk or defective. In MW consume water and approximately 3.7-3.9 L for 10 minutes and 5.4-5.7 L for 15 minutes formed for production 1 kg of husked walnut whereas there was only 0.14-0.34 L wastewater formed per kg of husked walnut in MWO. MWO did not consume water but this wastewater formed as a juice of husk. Produced waste water by MWO and by MW were given in Tables 2 and 3. Phytotoxicity tests and morphological investigations on representative plant species of horticultural interest was reported that WHW and their organic fractions can elicit a concentration-dependent stimulating effect on the growth of radish, lettuce cv. cavolo Napoli with effects up to 165%. An opposite inhibitory effect up to 70% was observed on spinach and lettuce cv. Gentilina . Table 2: Produced waste water by MWO. Table 3: Produced waste water by MW. Walnut husk was considered one of the low-cost by-products from agricultural, household and industrial sectors have been recognized as a sustainable solution for wastewater treatment. They allow achieving the removal of pollutants from wastewater and at same time to contribute to the waste minimization, recovery and reuse [8,9]. Uses by-products which were derived from green walnut husks for cosmetic and pharmaceutical industries were reported in the literature [3,10]. Also the results of  demonstrated the potential of walnut green husk as an economical source of antioxidant and antimicrobial agents. So that to obtain walnut husk at more neutral and dry form was important for both economical and environmental point of view. There are not at present specific legal devices regulating husk drainage so that land disposal of WHW is presently allowed without any prior treatment . Walnut green husk is an agro-forest waste which is a source of natural compounds with antioxidant and antimicrobial properties. Walnut husking results in the production of large amounts of wastewater containing the water extractable components together with hull residues. New husking system developed in this study do not consume water and produce 26.42-40.71 times lesser amount of wastewater than industrial system. Residual husk had richer component source because they did not be washed with water in this system. So that both wastewater and husk can be used as a richer source for especially agriculture, chemical, pharmaceutical and cosmetic industries. By this way a pollutant waste can be turned into valuable raw material which was easy to transfer and process for these industries. We would like to express our appreciation to the General Directorate of Agricultural Research and Politics (TAGEM) which supported this project. Karakus T. Dry type, walnut green skin peeling machine desing and manufacture. Trakya University Graduate School of Natural and Applied Sciences, Turkey. 2014. Ciniglia C, Sansone C, Panzella L, et al. Effects of walnut husk washing waters and their phenolic constituents on horticultural species. Envir Sci Pol Res. 2012;19:3299-306. Stampar F, Solar A, Hudina M, et al. Traditional walnut liqueur-cocktail of phenolics, Food Chem 2006;95:627-31. Ramos DE. Walnut production manual, UCANR Publications, US. 1997. Maleita C, Esteves I, Chim R, et al. Naphthoquinones from walnut husk residues show strong nematicidal activities against the root-knot nematode Meloidogyne hispanica. ACS Sustain Chem Engi. 2017;5:3390-8. Petriccione M, Papa S, Ciniglia C. Cell-programmed death induced by walnut husk washing waters in three horticultural crops. Environ Sci Pol Res. 2014;21:3491-502. Zhou X, Gao H, Mitcham EJ, et al. Comparative analyses of three dehydration methods on drying characteristics and oil quality of in-shell walnuts. Dry Technol 2018;36:477-90. Lawal OS, Ayanda OS, Rabiu OO, et al. Application of black walnut (Juglans nigra) husk for the removal of lead (II) ion from aqueous solution. Water Sci Technol. 2017;75:2454-64. De Gisi S, Lofrano G, Grassi M, et al. Characteristics and adsorption capacities of low-cost sorbents for wastewater treatment: a review. Sustain Mater Technol. 2016;9:10-40. Oliveira I, Sousa A, Ferreira IC, et al. Total phenols, antioxidant potential and antimicrobial activity of walnut (Juglans regia L.) green husks. Food Chem Toxicol. 2008;46:2326-31. Fernandez AA, Pereira E, Freire MS, et al. Influence of solvent on the antioxidant and antimicrobial properties of walnut (Juglans regia L.) green husk extracts. Indus crop prod. 2013;42:126-32. Huller & Dryer: Food Safety & GMP Manual - Dried Fruit. Association of California, USA. 2016. Xinlei Z, Yuan W, Wenlong L, et al. Optimization of Conditions for the Extraction of Melanin from Walnut Husk. Agri Sci Technol. 2017;18:818-26. Farhan AM, Salem NM, Al-Dujaili AH, et al. Biosorption studies of Cr (VI) ions from electroplating wastewater by walnut shell powder. Am J Environ Engi. 2012;2:188-95. Mishra S, Maiti A. The efficiency of Eichhornia crassipes in the removal of organic and inorganic pollutants from wastewater: a review. Enviro Sci Pol Res. 2017;24:7921-37. Oliveira EM, Silva FR, Morais CC, et al. Performance of (in) active anodic materials for the electrooxidation of phenolic wastewaters from cashew-nut processing industry. Chemosphere. 2018;201:740-8.